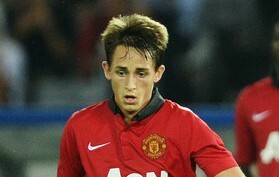 It has been revealed that Adnan Januzaj is chasing a new deal at Manchester United. The young Belgian has attracted interest from Juventus and Barcelona, but Januzaj, who has one year left on his current deal, wants to commit himself to United. “I don’t decide what happens with my contract,” said Januzaj to the Mirror. “I’ve got people behind me who do this for me. “Manchester United are a big club, I love it here and I feel good, so I hope to stay.